Teddy Roosevelt brought conservationism to the minds of the American public. The Bitterroot Mountain Range fire of 1910 almost destroyed this movement and the National Forest Service in two horrific days. Teddy's boy scouts, a scathing reference to the forest rangers, were challenged across three states with over 300 millions acres consumed by The Big Burn. Timothy Egan's account of the greatest force assembled to fight a wildfire in our history is fast paced and informative. Teddy Roosevelt triumphs and conservationism continues to gain momentum. Imagine what our country would be like today without our national parks? Thanks, Teddy. In THE WORST HARD TIME, Timothy Egan put the environmental disaster of the Dust Bowl at the center of a rich history, told through characters he brought to indelible life. Now he performs the same alchemy with the Big Burn, the largest-ever forest fire in America and the tragedy that cemented Teddy Roosevelt's legacy in the land. On the afternoon of August 20, 1910, a battering ram of wind moved through the drought-stricken national forests of Washington, Idaho, Montana, whipping the hundreds of small blazes burning across the forest floor into a roaring inferno that jumped from treetop to ridge as it raged, destroying towns and timber in an eyeblink. Forest rangers had assembled nearly ten thousand men -- college boys, day-workers, immigrants from mining camps -- to fight the fires. But no living person had seen anything like those flames, and neither the rangers nor anyone else knew how to subdue them. Egan narrates the struggles of the overmatched rangers against the implacable fire with unstoppable dramatic force, through the eyes of the people who lived it. Equally dramatic, though, is the larger story he tells of outsized president Teddy Roosevelt and his chief forester Gifford Pinchot. Pioneering the notion of conservation, Roosevelt and Pinchot did nothing less than create the idea of public land as our national treasure, owned by every citizen. The robber barons fought him and the rangers charged with protecting the reserves, but even as TR's national forests were smoldering they were saved: The heroism shown by those same rangers turned public opinion permanently in favor of the forests, though it changed the mission of the forest service with consequences felt in the fires of today. 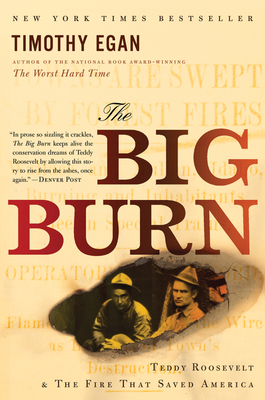 THE BIG BURN tells an epic story, paints a moving portrait of the people who lived it, and offers a critical cautionary tale for our time. TIMOTHY EGAN is a Pulitzer Prize–winning reporter, a New York Times columnist, winner of the Andrew Carnegie Medal for excellence in nonfiction. His previous books include The Worst Hard Time, which won a National Book Award, and the national bestseller The Big Burn. He lives in Seattle, Washington.